I am struggling to keep up. An unknown lung infection has been plaguing me since I started to wheeze on the first night of the Classic. I am on Platinum Creek, the evening of the fourth day, about 50 miles from the finish. My partner Katie Strong, and a team of three, Andrew, Toby, and Danny, are ahead. 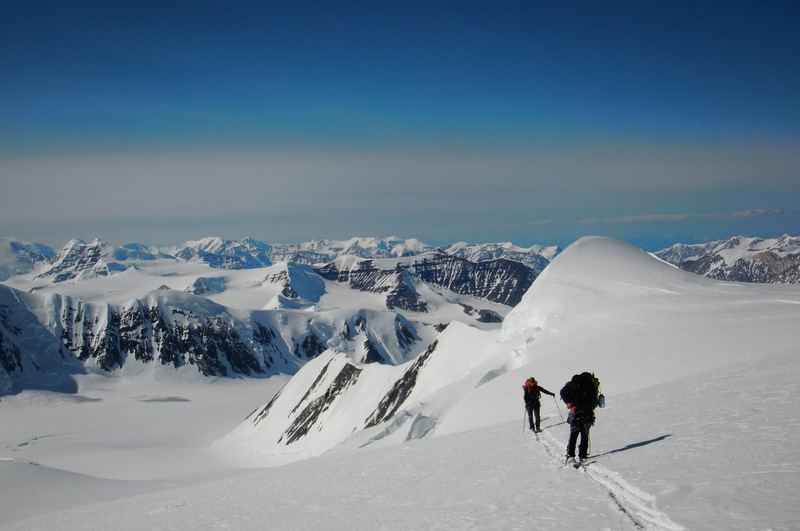 We had come up the Kennicott Glacier, past Packsaddle Island, and over a stunning 9,600ft pass near Mountain 12,454. The team of three had joined our track on the Nabesna Glacier after going over the Rohn Glacier, and caught us on the lake that morning. No sign of the other teams. In the late afternoon we had been shut down by the wind on the Nabesna River ice, forced to stop double poling and walk the remaining distance to the creek, where we all collapsed and aired our damaged wet feet. My breathing was short, harsh, and shallow. We ate chocolate and laughed. Bonds are formed in this beauty beyond fear between those who reap the rewards of wilderness travel. At an open water stop to fill up as dusk settled on Platinum Creek, I caught a hint of woodsmoke, and an incomparable joy suffused my drained and damaged being. Instead of a night of labored skiing in the dark to catch up, I knew there was a fire ahead. Andrew immediately placed a cup of hot tea in my hand on arrival, and a fullness of gratitude failed to be expressed through strained, difficult breathing. He had just broken his boot, and his Classic was over [hence the early camp], but instead of bemoaning his upcoming walk to Nabesna, he made me tea. His told me how his partner in the Brooks Range had been evacuated with pneumonia, and that I sounded similar. “Be careful, it is still a long haul”, he said. At this point I knew I could finish, I would just be slow, and only able to move quickly when feeling well at the beginning of the day. Katie knew I was struggling, having been kept awake by my hacking and wheezing, and graciously demanded the rope and my mountaineering harness in the morning to lighten my load. ‘Team Ham-Strong’ was going to finish what it started. Our Platinum Camp was growing; Derek, who had his partner bail at Nabesna with a broken binding and pole, and had traveled over President’s chair, showed up late that night. 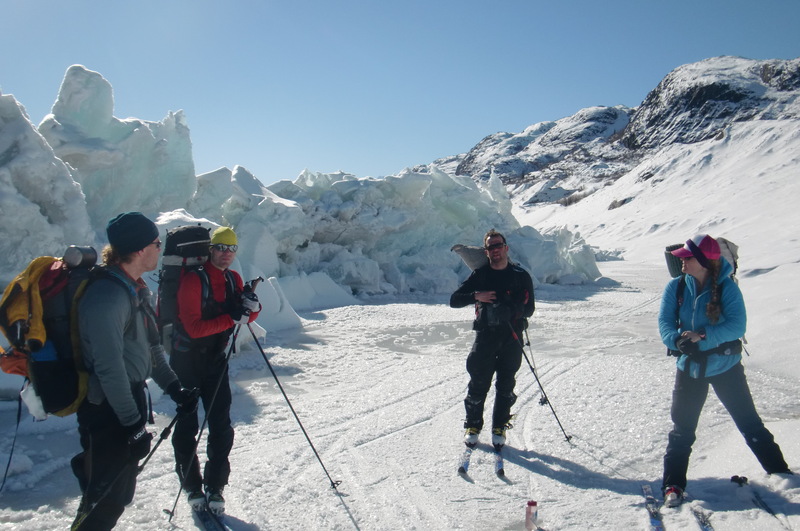 In the morning, Ben and Sarah, a sibling team who had skied incredibly fast around Skolai Pass, joined the group with independent Nicholai along shortly behind. Sarah was also suffering from this unknown illness, and we learned that Greg had been flown out with something similar. When Andrew fell back in the morning, we had a group of 8 trading the lead and the trail-breaking responsibilities towards our final major obstacle, Platinum and Noyes Pass. The simple goal of movement and survival leads to a forgetting of all goals, all separation. I was beginning to feel the mental benefits of such a punishing ski. The spontaneous, ephemeral nature of Being was manifest in the enormous hoar frost under my skis, the pressure ridges in the lake ice, the sparkling dance of sun on snow crystals. Future, past, self, all drop away into Now, the Eternal Now. Nothing can be gained or lost here. Death is nothing, or the immediate aliveness of everything wipes out Time. The communal delusion [of self, of concreteness], while necessary in society, muddles this state of Beautiful Being, which can still be attained in music, meditation, love, or art. However, I find the delusion most fully annihilated by the cleansing vastness, suffering, and kindness of wilderness travel. 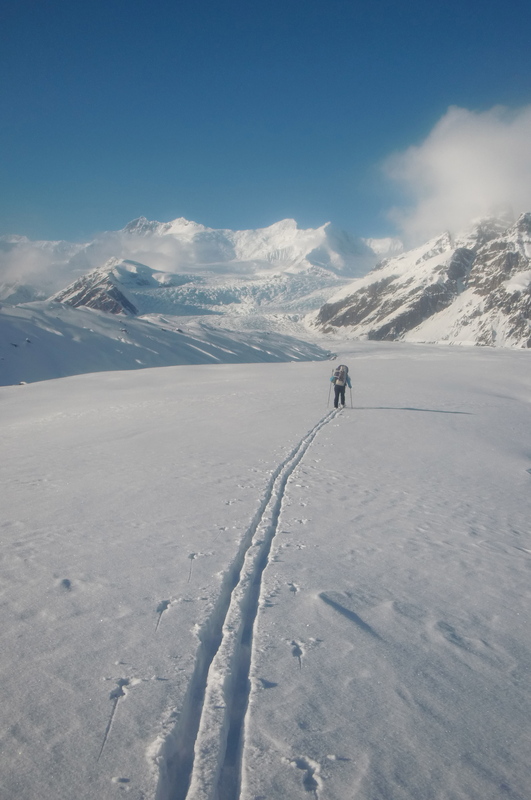 The deep snow of the passes could not stop the strong skiing of Toby, Ben, and the others, and soon the trail was in. I arrived at the top of Noyes Pass and collapsed in a pile. The toe of both my boots had ripped out during falls in the deep snow past Platinum Pass and were now held together with ski straps. Everyone was still there. Katie had melted me some water. Derek walked over and pressed some large white pills into my hand. He had had pneumonia four weeks earlier and was miraculously carrying antibiotics in case of a re-lapse. Sarah had already been taking them to help her. I was in no state to rufuse help of any form, and immediately took one. We descended the icy canyon of the Little Tok, standing movement such pleasure I could hardly stop smiling. We had amazing organizer Dave Cramer’s remote cabin to look forward to that evening, and a relatively short day out to the finish. Darkness fell, and I had to stop double poling often to try and catch my breath. Katie lit my path from behind with her powerful headlamp, and we made it to the cabin around 11pm. In the morning we set out late, 8am, after coffee and another fire. Katie was the expert on the route, having been there the past two years, and we soon found our way down through the brush and ice of the Little Tok. While skating just before the snow-machine track joins about 11 miles out, I noticed my binding was very loose, I had sheared off a screw head. As the others relished the last of their snacks, Toby, easily the strongest among us, broke out his own special metal zip ties and helped lash my binding down to my ski. Once on the track, I realized I only had one functional gliding ski, and would be severely handicapped. Katie was already ahead, so I told Ben as he passed that I would be too slow and to tell her to go ahead and finish, I could walk the last ten miles on the track if I had to. Before he and Sarah skied on he asked if he could take any of my heavy gear. The gesture alone made my pack feel ten pounds lighter. Toby, who could have finished hours ago, stopped as I fiddled with my ski again, making sure I had enough zip ties, and offered some advice on favoring one ski. These are examples of Classic “race tactics”. Once alone, I set down to perfecting a single ski shuffle technique. With a skin on the bad ski to cover the catching repair straps, I was able to push off in a skate-boarding-like motion, fully weighting the glide ski for as long as I could. After an hour I would switch legs and push with the other. This became a fun game of slalom skiing, navigating dips and turns through the woods on one ski. I was thankful for the time of solitary reflection, and even more thankful for the joyous finishing greeting I received at the Log Cabin Inn. The seven first place finishers had arrived 45 minutes prior, and were there cheering on the porch. Andrew as well, who had made it out from Nabesna and spent the morning clearing trees from the trail for us along the final four mile unplowed road to the finish. A beer was thrust in my hand, and as soon as my boots were off, I was sitting at a big table, smiling sunburnt faces all around, enjoying the best steak I have ever eaten. The Classic; you laugh, and struggle, and improvise, and rant, and release. You forget who you are and find new friends in remote places. Four hours later the remaining team of four arrived and another big meal was enjoyed. One solo racer, Chris, remains on the course as of this writing, and I hope his trip is full of rewards. 6/5/14 10,822ft. It is perfectly still. There is an opening thirty feet above that lightens the pale blue walls and strange dangling frost formations. The sky outside is full of wind and snow, and the mountain rumbles every so often with icefall. In front of my bivy the snow drops away through a large hole down the Northeast face–the opposite side of the ridge our group of seven is climbing. 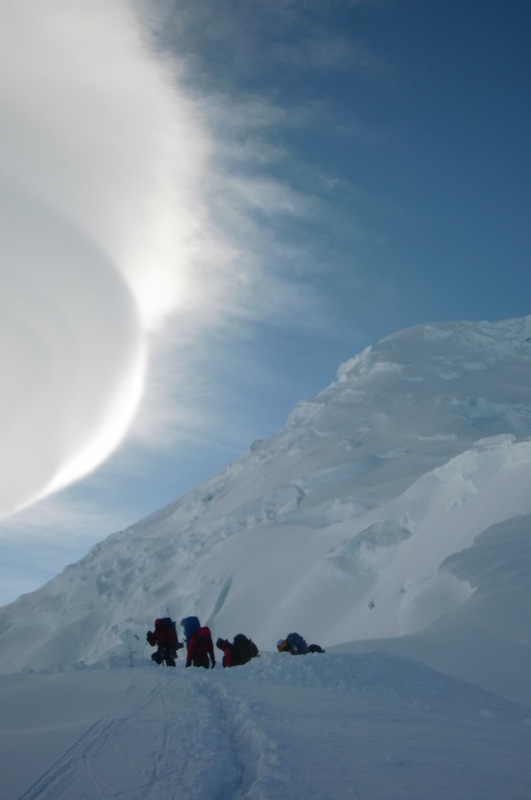 A T-shaped giant ice cornice crevasse. Forced to dig a snow cave by the force of weather, it soon opened into the roomy blue crack, and after a little belayed floor making we had a cold home for the night. Blackburn rages out on the ridge, but is all quietude and invincibility in here. 6/7/14 12,300ft. If we were in the throat of the mountain before, we are now perched at the mouth of an overhanging crevasse wall on the edge of all. The double sunset as the sun dipped behind Mt. Sanford and re-emerged late last night in a still unempty pink-orange sky was astounding. Such limited space in this eyrie that I melted water while on a two ice screw belay–mountains upon mountains below–light snow, dark rock, hanging glaciers, and the shoveling of fellow climbers. 6/10/14 10,500ft. ZIATZUOM is the word I see as I stare at the tent wall. I like the sound of it better than the relentless snow, wind, and zero visibility [what a roar…] that have pinned us to the narrow corniced ridgeline for the past 24 hours during our descent. Fellow guide Bennett LaValley and I tried to find the route this morning, but I ended up traversing a steep ice slope over a white-out abyss–not the route. Ate our last meal this morning. Supposed to fly tomorrow. Ahh, but what a glorious summit day. High above the cloud lumps in the sun, looking across at steaming plumes from active Mt. Wrangell and the summit of Sanford, the lake-like Nabesna ice-field glinting off its smooth smotherings, the sky full of ice crystal light over the Kuskulana Glacier far below. 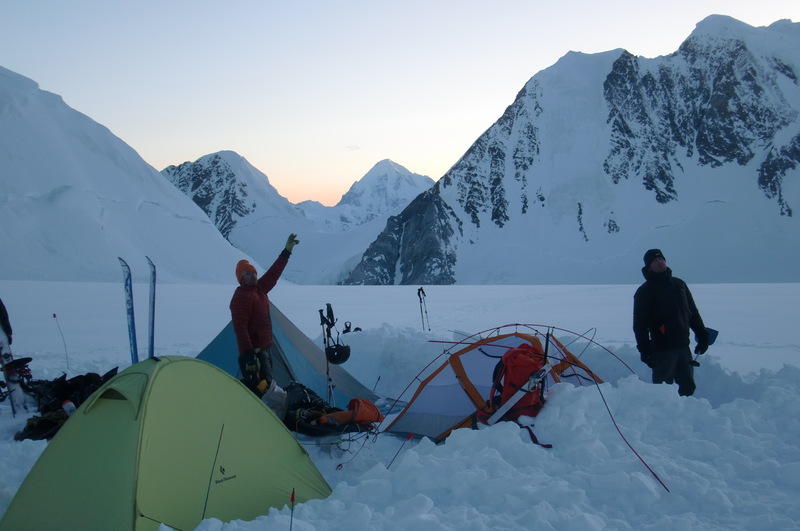 6/11/14 McCarthy AK 5:30 AM came cold, cold, and still after a night of tent-shoveling. A clearing. We scramble into boots, and Bennett is behind as anchor as I struggle through thigh deep new snow towards the edge. The route! A narrow steep slope down to the next ridge mound. Two steps and the snow splits at my feet, releasing the entire slope, cracks and blocks sliding smoothly away–gathering speed towards the disappearing edge. Strangely beautiful. I put in a trail along the two-to-three foot crown before returning for more support. After consulting with our leader Dave Staeheli, we packed up and with all six climbers tied in to 40-100 meters of rope above, . I set off two more massive storm slab avalanches to clear the route to our anchored rappel line. Cracks ran to the corniced edge, the first slide propagating and splitting off 25 feet below me, the second not releasing until I was in the middle of the slope–sudden motion all around as I remained motionless, securely implanted by crampons and ice axe in the stable layer below. 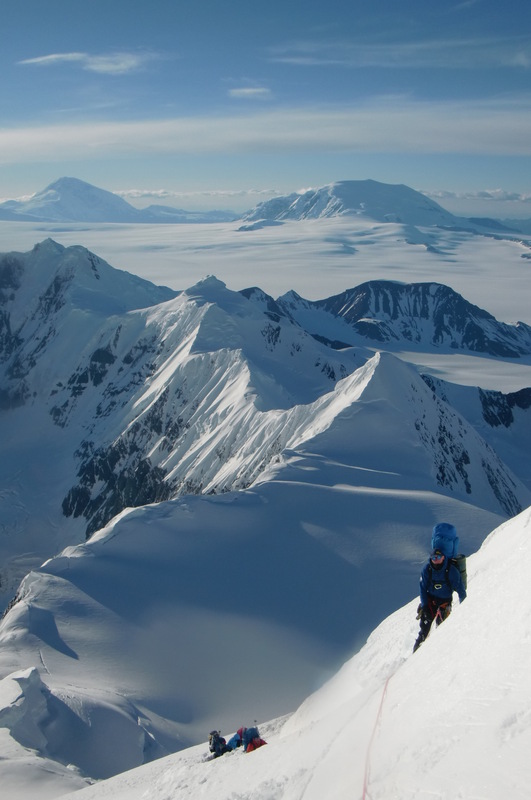 The anchor, rappel, 9,700′ camp, sleds, warming descent, crevasse fall, snowshoe stemming self-rescue, slushy base-camp cache beer, and a flight out with a field-repaired rudder finished off day 14 of St. Elias Alpine Guides 2014 Mt. Blackburn Expedition. 7,200ft. to 16,300ft. I walked the earth carrying the sky with a mood like the clouds. Peak after peak buttressed by snow mounded icefalls filled a vision dazzled by this mountain kingdom surrounding Mt. Bear (14,831ft.) The St. Elias Mountains. Such remote beauty a man could drown in it. 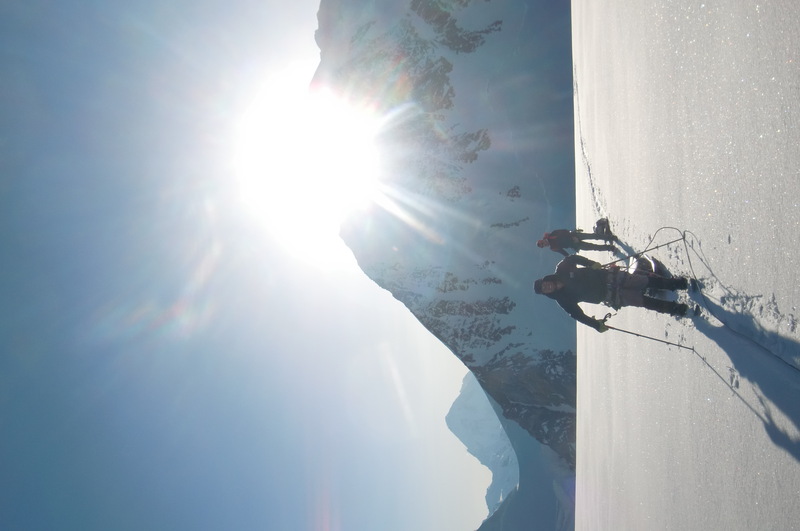 48 hours after Paul Klaus’ Otter landed on a branch of the Klutlan Glacier at 8,300ft., fellow guides Ed Ryan and Ben Woodcock and I were celebrating on the summit over a vast view of Canada’s Kluane National Park. Whipping wind numbed fingers as we pulled skins and prepared for the ski/splitboard descent. Navigating the crevasses in the icefall roped to two snowboarders was not exactly pretty, but it was effective and we travelled safely back to our high camp at 12,642ft. We melted water in our drifted over bivy hole, packed up our ultralight but heavy packs, and skied back to our Camp 1 tents at 10,035ft in time for dinner and a radiant sunset behind Universtiy Peak. The mountains were great hearted and magnanimous this day, and we were thankful. [Especially that the cracks only hungered after single legs, and not whole bodies]. Many thanks to Wayne and Gaia at St. Elias Alpine Guides for facilitating this amazing trip. So many things happen to a man alone in the wilderness: the unspeakable beauty of a mountain pass at dusk, gliding through untouched shimmering snow below silent northern lights, the mental machinations of continuous movement, ascending frozen creek canyons uncertain of pending dead ends, lonesome cold dinners with a view, falling painfully on and through overflow, a snow bivy in blue and gold. Most are not expressible through language. My eyelids are heavy, the woodstove crackles, and my frostbitten left toes provide an odd sensation of fire and numbness. They froze during a 70 hour push from Skolai Lake to the Nabesna River, during which I slept for five hours. The temperature dropped while I struggled across the wide expanse of smooth overflow that was the Chisana river. I started navigating with the stars, as the mail snowmachine track from last week had disappeared. Making warmth was difficult–only able to slowly double pole on the slick new ice. Breath obscured the stars and mountain outlines as my boots froze stiff. Finally a scratch on the ice–the track into the trees. At dawn a fire to assess my feet– waxen hard left toes from a failed chemical warmer and blister tape, and two dangling toenails. A mistake. Too long without checking. Resolved to keep them warm and no longer travel from 1am to 5am, I head to Notch Creek. The wall to wall ice in Cooper Creek Canyon required some improvisation. Without any traction tools and only half metal edges, I put my skis up, lashed a found bolt to the tip of my boot, wrapped my foam pad around my right arm, and vowed to fall right, purposefully diving down inclines head first, ski tips clattering above my pack. This got me to snow, and the northern lights pushed me on through the wind to the Nabesna and a boots on bivy. This was all post Golden Horn, the terrible day long brush and ravine challenge slog above Skolai Creek. Physical limits where reached, and somehow always surpassed. Mental alacrity failed [to the point where imaginary companions Hans and Klaus commented on everything in their German accents], but the joy of mountain movement remained. Five days and ten and a half hours of full and true wilderness adventure. 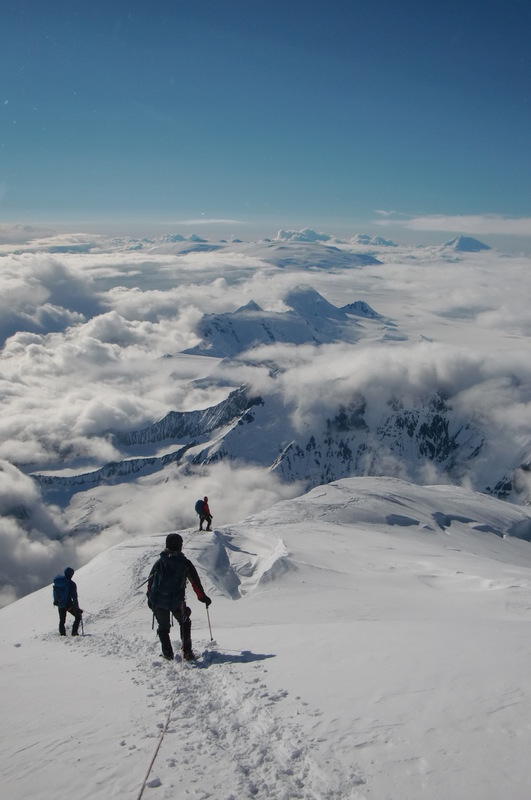 At least 200 miles of Wrangell Mountain Glory. I would like to thank organizer Dave Cramer for his dedication and unsurpassed hospitality and Log Cabin Wilderness Lodge for the copious finish line comfort and food. “I start out on this road, call it love or emptiness. I only know what is not here. for remnants left on the bottom of the cage. Close by, I am rain. Far off, a cloud on fire. I seem restless, but I am deeply at ease. Branches tremble. The roots are still. Talk about choices does not apply to me. The venerable Lamas sit crimson robed and spectacled midway between the towering peaks of Everest-Lhotse-Ama Dablam, and the five costumed dancers with their tall hats, colors, bells, and drums. Skips and full spinning turns, clanging cymbals, heavy drums, trumpets and strange yells. A masked jester with big white hair gave a tease of a dance and ran back inside the gompa. Mani Rimdu, an elaborate ritual that commemorates the triumph of Buddhism over Bön, the tribal predecessor. Perched in the top of a juniper tree, the cymbals and repetitive horn blasts rose up, seemingly amplified by the surrounding alpenglow peaks. A moment that strikes at innermost being, unreal and actual. In the gathering darkness, twenty women in an arm over shoulder line sing cyclical mantra songs and stomp a rhythmic dance. The silences are filled with the shouts of children playing tag. A long string of prayer flags flutter in front of me like a rainbow. The horns of the monastery can be heard mingling with the roar of the Imja Khola. The ice and granite of Kantega and Thamserku play with shadow and cloud. Lhotse is cloud-hidden, but Chomolungma and Nupste shine in the sun. My back to the stupa, my bivy unparalleled. A massive piece of hanging glacier on the Nupste face across from my perch cracked off—the billowing clouds and waterfall-like snow pummeled down the face to a cone of avalanche debris. Lhotse and Makalu reveal granite faces, and a series of stunning down valley peaks sweep around to Cho Oyu. Clear blue sky slides down to endless fluted ridges. Ineffable mountain beauty. The snow flutes on Nupste’s face formed a thousand sunset cathedrals. Sagarmatha captured the last red light. 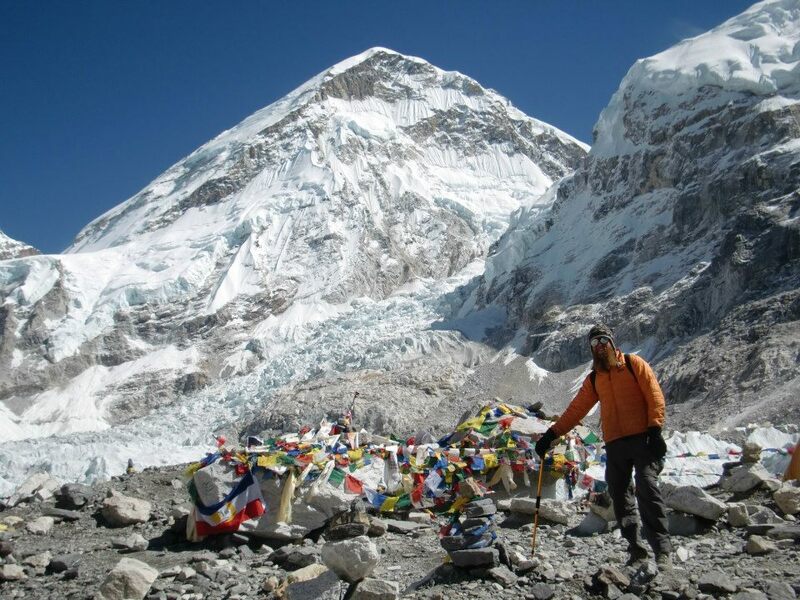 Ama Dablam stood like a champion on a pedestal. A cold clear Kala Pattar twilight. Marveled at the icefall from the Khumbu glacier at noon. The yaks are sitting idly by the spring that feeds into Dudh Pokari, the clear water fusing with the turquoise mass to form a sacred lake. There are no ritual immersions as during the Sacred Thread Festival, just the wind ruffling shining riffles below 6,000m Phari Lapche’s snow dusted cliff. The final stage of the Three Passes Trek [Renjo La 5,360m] stands across the lake. The first two having been challenges—acute mountain sickness hitting on the Kongma La from Chukhung as a debilitating headache and slow-motion wobbly daze, and then over the icy Cho La while recovering from a feverish food poisoning/virus episode in Dzonglha—I hope to be strong and healthy for Renjo. 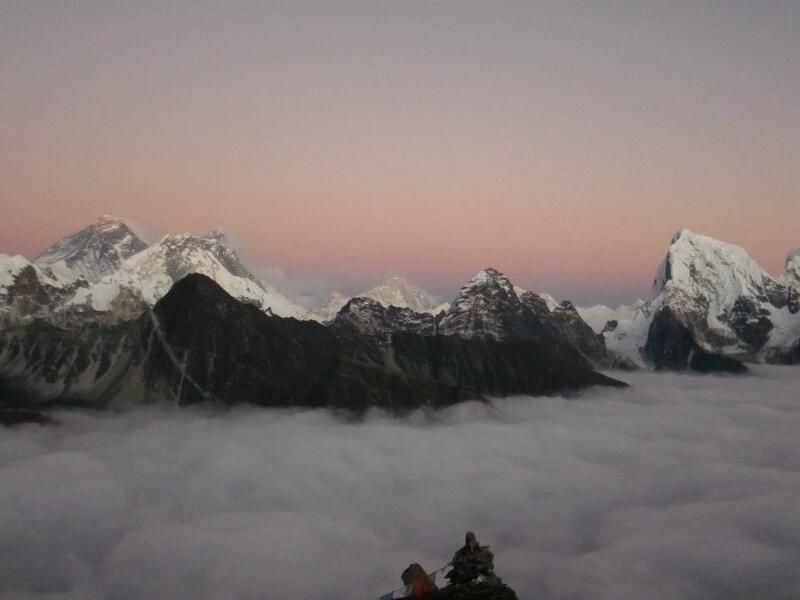 Watching the sunset on four of the tallest mountains on earth from Gokyo Ri—the sky a bruised purple-pink behind stark summits of grey and white looming over an impenetrable cloud bank— a moment of unfathomable upness. Such sights empower, enlighten, and annihilate simultaneously. The humbled self is no more, elevated into the staggering All of it all. The throbbing cranium pressure, lack of air, tortuous fever dreams, and bodily voiding that occurred to get here become worthwhile and necessary. I am not there, I am here, everywhere—content and still. “When climbing, the presence of mind that one needs in dangerous situations makes one naturally undistracted, and that undistractedness is what generates awareness and a feeling of being completely alive. Every action becomes meaningful because each movement is a matter of life and death. 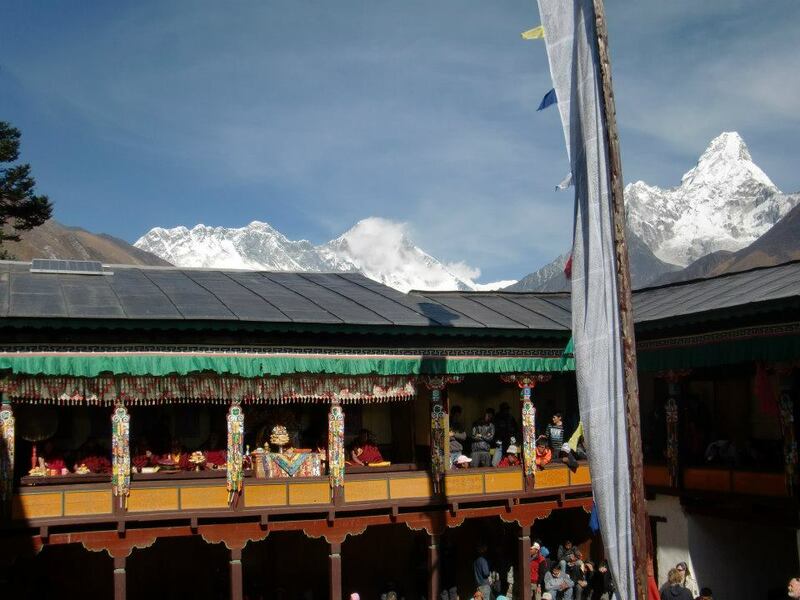 In a sense, anyone who intentionally travels into the mountains is on a pilgrimage to Miyolangsangma [goddess of Everest] and the other Five Long Life Sisters. But theoretically, we shouldn’t need to go to the mountains to visualize them and make offerings to them. We should be attempting to carry the spiritual experience of the mountains with us everywhere. Well said, and something to aspire to. I watched the cloud shadows move up the rock, morphing in slow motion. 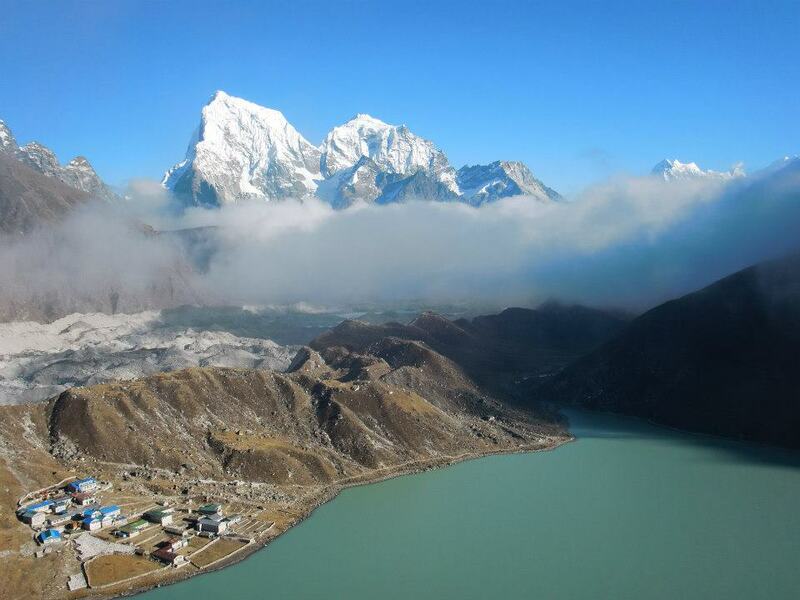 A new height towering above the sixth lake [Ngozumba Mountain], the mass of Cho Oyu’s grey glacier out in front. 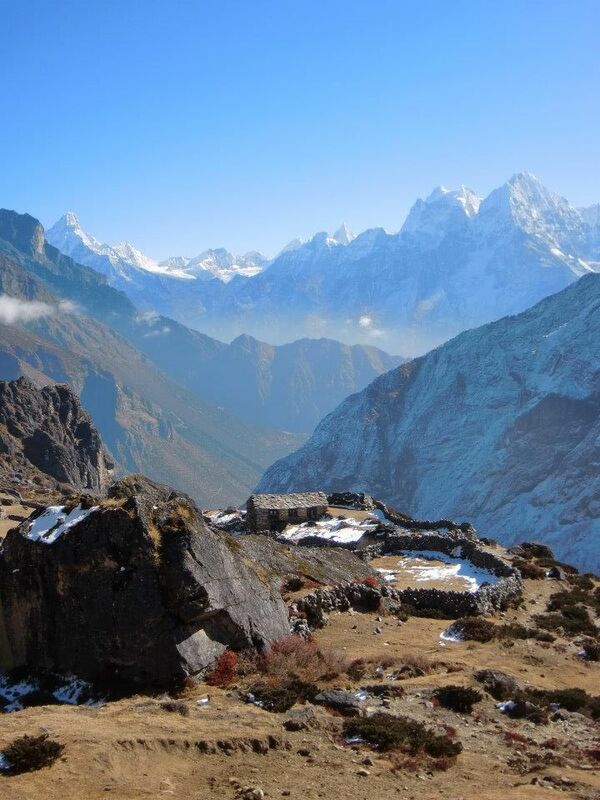 Clear new views from Makalu over. Quiet besides the crack of avalanche, I feel I can nearly hear the hum of the Himalayan sisters. Rock garden bivy—mist rolling in, ridges lit, wind dead. Frost already gathering on my bag below luminous mountains. Yak cheese and ginger biscuits. Lake ice lasers ping. I must get my hands inside. I awake to the sliver moon and the evening star, the white outlined peaks set off by the stars. Cold. Rock in thigh. I lay, observing the sky lighten. How grateful I am to have seen these sights, to have been immersed in the Himalaya. A dream fulfilled. Down to Namche, Lukla, Kathmandu, and then London.